When it comes to your face and skin, going natural is the best choice. 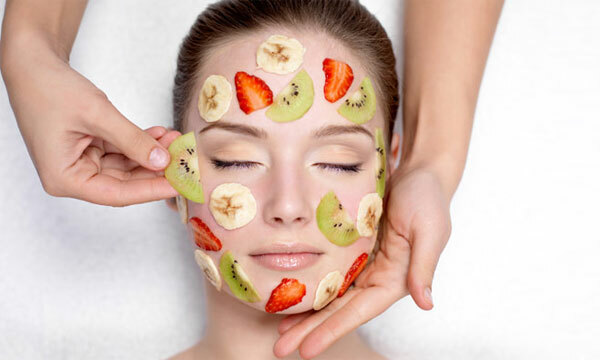 Fruit packs are most effective as they are made from fresh fruits and do wonders for your skin. Fruits are nourishing, when used both internally and externally. They are rich in minerals, vitamins and all essential nutrients. There are a number of fruit pack options which have amazing effects on your skin. Apples contain antioxidants, vitamin A and C. Bananas have vitamin A, B and E. turmeric has antibacterial properties and improves your skin complexion very well. Preparation Method: Blend apple and orange together and add a pinch of turmeric powder and 1 tablespoon honey. If you want, you can add milk to it. Apply the pack to the face and your neck and wash it off after 30 minutes. This pack suits all types of skin. Avocado contains enough vitamins like A, B and C, and also potassium. Kiwi contains vitamin C, E, and A. Preparation Method: Mash the kiwi and avocado until it becomes a fine paste. Add honey if you prefer. Apply it on your face and leave it on for 15-20 minutes. Wash it off well. Using this regularly gives you a nice glowing skin along with some good anti-ageing benefits due to the medicinal values present in avocado and kiwi fruits. Blueberries are rich in a variety of anti oxidants. These are good for your skin. They also help repair the damage from sun on your skin and acne, and gives back the glow for your dull skin. Strawberries are rich in vitamin C, which aids production of collagen. It has anti ageing properties and reduces all sort of wrinkles, fine lines, blemishes and even acne. Most skin care products are rich in vitamin C because of its beneficial properties. Watermelon also helps in removing blemishes from your skin. It contains vitamin C, B and A, and also keeps your skin fresh, hydrated and radiant. Preparation Method: Take the pulp of the strawberry, blueberry and watermelon. Add oats to the mixture and make a fine paste. Use this paste to apply on your face in a circular motion. Your skin immediately absorbs all the watermelon and berry. Only the oats that is left over will exfoliate your skin as you rub. Banana contains minerals, and vitamins A, B, C and E. They help in improving or maintaining healthy skin and recover your hair. It is also rich in natural oils and potassium. This is what makes banana an excellent softener on your skin. Banana also contains an amino acid called tryptophan, which makes it the best ingredient for all kinds of beauty treatments. Method: Mash together the strawberries and the banana. Add honey and apply to your face thoroughly. Wash it off after 15-20 minutes for a glowing skin. Cherries contain lots of anti-oxidants, vitamin A, C, beta carotene, and other mineral nutrients like potassium, magnesium, and iron. They have skin lightening and anti-ageing properties. Strawberries contain salicylic acid and vitamin C, and have anti-ageing effects. Together, these 2 fruits, along with honey, act as a potent tonic for your skin. Preparation Method: Crush the cherries and strawberries in a bowl. Add honey to it. Apply the mixture on your face and neck and wash off after 30 minutes. It offers long term benefits. Grapes are rich in anti-oxidants and alpha hydroxyl acids. They have anti ageing properties. Preparation Method: Mash the kiwi and grapes and apply on your face. Leave it on for 20 minutes and then wash off. This pack prevents ageing and also gives you a glowing skin. Kiwi is rich in vitamin C, E and K, which enhance collagen formation and also replenish the skin with antioxidants. Kiwi has black seeds that contain fatty acids omega 3 oils. These are beneficial for the skin. Kiwi helps brighten dull skin and also has anti-ageing properties. Preparation Method: Mash the Kiwi fruit and banana together and add curd or milk as you prefer. Apply on your face and neck. Let it stay for 30 minutes, and then wash off. Mango contains vitamin C, and curd is rich in lactic acid which helps in cell regeneration and removes dullness and pigmentation. Preparation Method: Mix the mango pulp and curd. Apply it on your face for 20 minutes before washing off. Using this pack regularly gives your skin a glow. Peaches contain vitamin C. When used with tomato, it cleanses your skin and is an effective face pack. Preparation Method: Mash together the peach and tomato. Add honey to this paste. Apply the pack on your face and wash off after 20 minutes. Using this regularly makes your skin glow. Strawberry has got excellent anti-ageing benefits. Preparation Method: Mash the strawberries in a bowl and add honey and lemon juice to it. Apply on your face and leave on for 15 to 20 minutes before washing. This is beneficial especially for oily skin. These fruit packs make your skin feel fresh and gives it a natural glow. They have amazing benefits on your skin, and using them regularly is necessary to reap all benefits.